Dr. Bradford Parkinson is a Professor Emeritus (recalled) in the Aeronautics and Astronautics Department of Stanford University. He was the Chief Architect for GPS and led the original advocacy for the system in 1973 as an Air Force Colonel. Gaining approval, he became the first Director of the GPS Joint Program Office and led the original development of the GPS spacecraft, Master Control Station, and eight types of user equipment. He continued leadership of the program through the extensive test validation program, including being the Launch Commander for the first GPS satellite launches. This original deployment of GPS demonstrated comfortable margins against all positioning, navigation, and timing requirements. Earlier in his career, Dr. Parkinson was a key developer of a modernized AC-130 Gunship, introduction of which included 160 hours of combat missions. He was an instructor at the USAF Test Pilot School. In addition, he led the Department of Astronautics and Computer Science at the U.S. Air Force Academy. He retired from the U.S. Air Force as a Colonel. Pioneering the augmentation to GPS (WAAS) that allows any user to achieve accuracies of 2 feet and very high levels of integrity assurance. Dr. Parkinson has been the CEO of two companies and serves on many boards. He is the editor/author of the AIAA Award winning two-volume set Global Positioning System: Theory and Applications and is author or coauthor of over 50 technical papers. You recently opined that the GPS and GNSS are under serious threat in context of Ligado. Could you please explain what exactly you meant? Let me give an update. We recently had an unusual PNT Advisory Board (PNTAB) telephonic meeting regarding the latest Ligado proposal for using 9.8-Watt transmitters in a radio band near GPS. We, the Advisory Board, sent the ExCom (National Executive Committee for Space-based Positioning, Navigation and Timing) a unanimous letter that strongly recommended disapproval of the Ligado proposal. There were many reasons for this. Most important, that the proposed transmitter density is not known. Ligado has refused to tell us what the tower spacing is going to be. And it is my belief that they’re trying to deploy a 5G communication system. Many smartphone users are familiar with 4G. We know 5G is quite different. 5G will use much more powerful transmitters, with much closer spacing. For example, they call for picocells – at the smallest deployment, maybe 100 meters spacing or less. The US government testing has shown that 10 watt Ligado transmitters, spaced about 20 km apart, would still degrade 10% of certain high-performance GPS receivers in that region. Earlier, with powerful transmitters, Ligado had proposed 400 metre spacing. This reveals a fundamental incompatibility. As a result, many US organizations have filed strong opposition to their proposal. When all this started? Is it something to do with LightSquared? Ligado is a successor to LightSquared. LightSquared came out of bankruptcy and its successor company is Ligado. They claim that they have a new plan but frankly speaking their new plan was not a lot different than their old plan, in terms of GPS interference. It all started in 2011 when LightSquared proposed that the FCC restrictions on its existing frequency authorization in the Mobile Satellite Service (MSS) band (a faint signal, satellite-to-ground) be waived. This would allow the license to effectively be repurposed, allowing highpower terrestrial transmissions. The company has two space-to-ground authorizations in the 1525–1559 MHz band (1526–1536 MHz and 1545–1555 MHz) very close to the GPS primary frequency (L1 at 1575 MHz). Initially, it requested repurposing to ground transmission of 42 dBW (15.8 kW). For Ligado, this is a great opportunity if they have the authorization to repurpose their existing license. Some believe that the value of their license might increase by over 20 billion USD. You mentioned that Ligado may try to push for 5G allocation. Can you elaborate on the likely consequences of this? Our belief is that they are probably trying to develop some form of a 5G network, which is a much more capable than the existing 4G. 5G advocates claim that their maximum data rate is 20Gbit per sec. At that rate, a single user should be able to achieve a gigabit of data connectivity. 5G plans call for frequencies anywhere from 600 MHz to 14 GHz. Increased capacity is not free. Advocates also state that the received wireless power from a 5G network will be 30 times stronger than 4G LTE systems. The only way they’re going to achieve that is through much greater tower density and/ or higher power. And 5G wireless calls for the construction of smaller cells, not much larger than a football field, going down to the micro cells whose coverage radii might look more like your Wi-Fi. That sort of sets the scene. Chart 1 provides a visual example to understand this. The small green square, lower left, illustrates the GNSS degradation limit radius. Interference noise will not exceed the 25% International Standard (technically the “1 dB standard”) outside that radius. Inside that radius, it does. We call that the degradation limit. If the GNSS community accepts even a 10 percent area degradation, so that 90 percent is protected, the radius or spacing between those transmitters has to be at least 6 times that degradation radius. It’s clear geometry, and easily calculated. If the GNSS community wants to protect half of area region, the spacing then will have to be 2.4 and so on and so forth. For GPS and GNSS, we believe that at least 90 percent of the area should be protected. That means that the minimum spacing between transmitters must be 6 times the degradation radius. The situation would be as shown in the upper right rectangle. For GPS/GNSS transmissions at 1575 MHz (“L1”) this has strong implications. If the GNSS community accepts 90 percent protected coverage area, the latest Ligado 10-watt transmitters would have to be spaced at least 18 kilometers apart to protect High-Performance GNSS Receivers. If you view it another way, with their earlier-proposed 400 m spacing, Ligado power would have to be further reduced from 10 watts to 0.036 Watts (2500 times lower) to protect all tested High Performance Receivers, even if only protecting 90% of coverage region. There is another issue in the Ligado filings. They stated that, for any GNSS user experiencing interference, they can just call Ligado. Asking the High-Performance GPS Users, for example the survey community, to monitor the interference is totally unrealistic – they would not know how to do it and would have no means to trace the problem to Ligado. Ligado also continues to ignore emerging use of modernized GPS and GNSS signals (e.g. L1C). Impacts to receivers tracking these wider bandwidth signals could be worse than that for the current GPS signals. If Ligado’s current license is approved, their spokesperson, in a public meeting about a year ago, implied that, over time, they would expect to be allowed power increases. Their temporary power reductions offer is only to gain regulatory approval and it must also be recognized and rejected as a “nose under the tent”..
To repeat, their proposal is deliberately vague on geometry and spacing of towers. Ligado has steadfastly declined to provide critical technical details to PNTAB to enable full and accurate assessment of interference. They have addressed Aviation (433m) and ignored High Performance Uses that have shown to be much more sensitive to degradation. 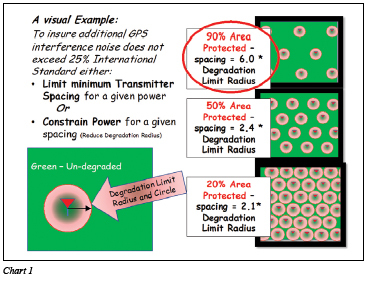 Can you explain the probable degradation in performance of GPS/ GNSS receivers? 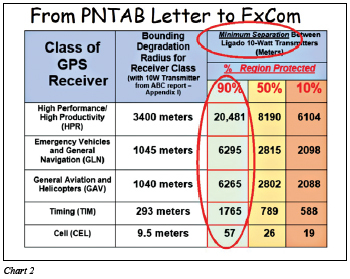 Our letter from PNTAB to ExCom (available at https://www.gps.gov/governance/ advisory/recommendations/2018-08- letter-to-excom.pdf) clearly explains the bounding degradation radius for five different classes of GPS receivers for a 10- watt transmitter. The letter is based on the extensive Adjacent Band Compatibility (ABC) Testing performed by the US Department of Transportation. High performance receivers, will begin to degrade at 3400 metres. So that is the degradation radius. To insure 90 percent of the region is not degraded, the Ligado spacing has to be over 20 kilometers (6 times the degradation radius as discussed earlier). The DOT considered other classes of receivers that are not high precision and (and have narrower bandwidth). For example, considering General Aviation (GA), the degradation radius is 1040 meters (see chart below) To protect 90 percent of the area for GA, the tests show that transmitters can be no closer than 6 kilometers. Unfortunately, 6 kilometersspacing is never going to support 5G data bandwidths with a 10 watt transmitter (Chart 2). GPS in 2020 will be transmitting signals L1C/A, L2. L5 and L1C. Given this, do you think that 1dB protection debate is exaggerated? Can the power of L1 GPS C/A transmission be increased to L2? First of all, the 1 dB (a 25% increase in noise floor) is a long established and accepted international interference standard. It is an allowance based on the expectation that there are many other sources of interference. In the case of Ligado, the tests are based on a single transmitter, not an aggregate of all transmitters in a region. They are therefore a “best case” for Ligado. Further, I believe the problem is not exaggerated. We are trying to protect all existing users. GPS was deliberately placed in the quiet, MSS portion of the spectrum, which recognizes that high power, ground transmitters can overpower weaker signals in a very non-linear way. As a reminder: the GNSS received power is on the order of a tenth of a millionth of a billionth of a watt. An adjacent band is not a proper location for high power transmitters. We believe that the threat of higher power, nearby transmitters can be somewhat alleviated with advanced GNSS receiver designs. The costs of doing so, and the impact on high accuracy remains to be seen. In any case retrofitting various classes of GNSS receivers requires long lead times. An example is commercial aircraft, where retrofitting takes, say 15 to 20 years. If you’re going to change your frequency allocation table in such a way that you degrade aircraft or helicopter equipment, it’s not like your cell phone; they don’t buy a new one every year. So, the protection that we are trying to give to the existing community is for all classes of users and types of equipment. To solve interference issues by increasing satellite transmitter power is extremely expensive and would require 10s of years to retrofit the whole constellation (if the decision were made today). GPS averages about 2 launches a year. From a first launch, in 6 years or so, it would take another 12 to achieve any new capability. So, the point I’m making is that there would not be an easy transition. The additional frequencies are absolutely going to help but that is not a complete solution. So why would you seriously impair the existing users’ capability because somebody wants to watch a movie! There are many other frequency bands that 5G can and will use. What is the status of the GPS modernization programme? We’re have just launched the first GPS III and signals should be available this year. An additional 11 are on contract and another contract for 22 GPS IIIs has been signed, the largest contract the United States Government has ever penned. Part of this, which I find very interesting, is that the latest contract includes continual upgrades and improvements in clocks and signal structures. So this is embedded as the part of the procurement. Recently, the Federal Communication Commission, (FCC) has approved the use of Galileo in the US. What is your opinion on this? Yes, the FCC has authorized the use of E1 and E5 frequency bands as they are in the same bands effectively as GPS L1 and L5. However, they did not authorize E6. 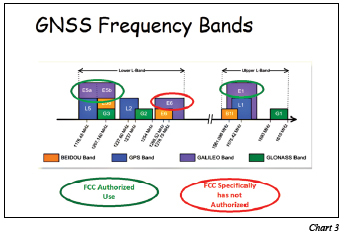 The reason they said is that E6 band is not allocated for navigation purpose in the US (Chart 3). Though in my opinion the users would be better off if they could use the E6 but that is the decision that the FCC has taken. Would you like to comment on the clock failures that some of the GNSS systems had to go through? If you look at any of the GNSS satellites, they are really synchronized clocks. That’s the essence. So we want a clock that has good long-range stability. When I first led the system design, we recognized that a huge challenge was to make an atomic clock that was robust. We had to make it resistant to failures. It is not easy to do that. I might seem bragging a little, but we have had GPS satellites that are 25 years old and are still working. I think that’s a tribute to a very rigorous development program. We ran some very harsh tests on the ground to make certain we knew that they would survive. Any research going on in the domain of clock development? Absolutely, there are. As a matter of fact, the Jet Propulsion Laboratory (JPL) is putting together a really interesting new clock, based on mercury ions. I think it’s going to fly sometime in the next six months. Of course, the Europeans are working on a hydrogen maser. I have to tell you, we also had hydrogen maser but had to cancel the program because we could not see a completion date. And you know this was 34 years ago. We could not see any way to get the development clock small enough and low enough in power. Hydrogen masers at that time had a history of early failures. So, I think the hydrogen maser is a good candidate if it can be made small. Apparently, the mercury ion clock can be made small and might have improved stability by a factor of 10. Interference has been one issue that has been highlighted. Along with spoofing and jamming are also discussed as threats to GNSS. What is your take on this? Our advisory board is addressing this with a Program. The fundamental purpose was assuring PNT. Again PNT, not GPS, but PNT. The Program has three aspects. We call it PTA for Protect, Toughen, and Augment. In terms of protecting, toughening, and augmenting, the major threats are either jamming, which could be inadvertent or deliberate, or spoofing. Of those two threats, I consider jamming much more serious. And the reason is very simple. If you are looking in detail at the techniques for spoofing, by and large a smart receiver should be able to find out when that’s happening. So in that case, spoofing would not give a wrong answer. Instead, the receiver understands that there are two alternatives — that it can use techniques to operate correctly in spite of the spoofing or it has to declare that it no longer has a good solution. It’s either of them. And the net result is not a misleading position. I believe a much more serious problem is jamming. It turns out that there are many techniques that work against jamming. The ones I really like are the phased array antennas that use beam-forming. This makes it difficult to jam. If we go to modern signals and go to multiple constellations, you also have a lot of jamming resistance through redundancy. So I’m not trivializing the problem. It’s a serious problem. But the point I’m making is: the T stands for making the receiver resistant to all of those inadvertent or deliberate interferences. And there are ways to do that. What is your take on eLoran as a back up to GPS? I think it’s the most viable backup. Yes it’s clearly a long way from the capability of GPS. It’s not three-dimensional. It’s in essence a regional system. It does not have the accuracy even with the differential correction that its design offers. But it’s a much more powerful, less jammable system. I think it should be possible to build a Loran receiver on the same chip as a GNSS receiver. The antenna would be quite different, but well understood. And if you can do that and have a full backup, then the person who thinks they can jam you, suddenly has a much more severe problem. I think that’s the essence of the argument and I don’t see any other systems having that capability. And the cost, relative to GNSS, is very small. In 2010 in an interview with us, you spoke about robotic automation. That was the key trend you predicted. You mentioned about driverless cars in one your presentations in Kyoto three years before. What trends you see in next few years? The driverless car is certainly one form of automation. While it isn’t going to be accepted suddenly, is already being demonstrated as a series of steps. In part, acceptance is going to be driven by convenience. But perhaps stronger drivers are going to be the safety and economics. For example, in the US, the people who operate large trucking firms have difficulty finding drivers. Driving trucks is grueling work. Now at least two manufacturers have demonstrated driverless trucks. And think about it – normally truck driving in this country is limited to 12 hours a day. If you go driverless, truck use can be extended to 24 hours, and add to that, owners won’t have to pay retirement and health benefits. If you go through the economics and a probable case, it will be safer and a lot easier to use robotic automation for driverless trucks. We are also going to see automation in driverless airplanes. Not in the people-carrying planes, but in the cargo. Since airplanes take much longer to upgrade and manufacture, we might also eventually see specialized designs for cargo airplanes that do not have some of the refinements that are in current aircraft. In fact, there is a whole wave of such vehicles already in use – we call them UAVs. What else you would like to predict? My belief is that much will continue to happen in sensor technology. Sensors in cell phones will continue to get more and more capable. RTK was not normally used in a cell phone. But all of a sudden, a number of GNSS chips are measuring carrier wave cycles and providing that to application developers. That is one piece of a new wave of “system of systems” designs and opportunities. And application developers will exploit that capability, which is virtually free. They are also going to add chip scale atomic clocks, lidars and radars. They are going to make a driverless car or a driverless truck much safer. So what I see, in terms of technologies, is the integration of a lot of devices that are continuing to advance. What could be the advantages and disadvantages of the multi-GNSS scenario? Well, within limits, the more the merrier. It’s an expensive game for the provider! The question is how many constellations does the user need. There is a technical concern and that is if we get too many, all broadcasting on L1C, and we will start to raise the noise floor. It’ll become like the tragedy of the commons, which is when too many sheep graze on the grass and pretty soon you don’t have any grass. There could be an issue like that, but I don’t have any concerns about that right now. Instead, I see enormous benefits in having multiple providers in the GNSS scenario and I’ll explain why I see such enormous benefits in this. It’s because when you are controlling your own integrity channel (say EGNOS or GAGAN), you are measuring satellites that you may not normally trust, but you’re also measuring them often enough, so that if they were to try to do something that’s misleading, you can pinpoint the problem. And for the Indian user of GAGAN, or EGNOS for European users, or in the case of WAAS for a US user, you instantly can tell the user in your country and your sovereign nation or in your group of nations that there’s something wrong with a certain constellation or satellite. And you can resolve it. You are taking control. You no longer have the dependency that’s risky. For example, in the USA, in my opinion, we should authorize the use of GLONASS provided we measure its integrity. Yet the larger problem is that that it is politically difficult. But in my opinion, if we measure the integrity, the user will know within six seconds whether each satellite is usable. When that is done, the WAAS-like provider has total control of accuracy and integrity. And in that sense, anyone could, with a WAAStype system, use all constellations. So, I don’t think there’s any significant risk in multi-GNSS. Word of advice to the countries who are striving to come up with their own GNSS systems? They will need a lot of money. It’s not easy! If they have ambitions to put up a worldwide system, I guess I can’t for the life of me envisage that there is need for yet another. So, all I can say is it’s very expensive and it takes much longer than you think. We launched our first GPS satellites forty-four months after we got approval. After the first launch, we quickly launched the other 11 that were available. But it still took us almost 20 years to get an operational system. The problems were mostly money and will. But in part the question was: why you are launching satellites if you don’t have any users out there? The satellites must come first, and then the user will come. Your comments on Indian System IRNSS and its signal allocation? There is an international recognition and entusiasm for IRNSS as a r egional system. The second point is where to put any augmenting signal. The US placed it at 1575 MHz. N ow we’ve got one at 1227 MHz. The question is the ease of use . For well-known technical reasons, L-band is the sweet spot, and using GNSS allocation bands makes a lot of sense . If corrections are broadcast on higher fr equencies, the user will probably require beam antennas, or the pr ovider would have to significantly increase the satellite power. So those trade-offs can be made the way we made them on GPS to ensure that we had global coverage. And in the case of India or Japan, your trade-offs may be quite different. It has been an intriguing journey for you? If you would like share some high points and low points in addition to that you have been a great leader in terms of getting the entire project from the word go. What is your leadership advice? The high point was actually launching the first GPS satellite which worked flawlessly. After four were launched, our testing verified our claim; we were easily beating 10 meters accuracy. All of that was very much a high point. The low point occurred in a situation where we experienced a nagging ground test failure in first GPS satellite’s earth sensor. We couldn’t figure out what it was. I thought we were going to miss the launch. We finally made it. But the reason for this failure was that one of the manufacturing people had put in an extra cleaning step that was not called for. He did it with good intentions, but in the process he destroyed the coating on the sensors and it took us months to figure that out. But that was certainly one of the low points. Credit for the success of GPS belongs to many fine engineers. While I understood the project well, including the keys to make it work, I was able to hire some of the greatest engineers in the US. It is a joy to run an organization that is populated by people like that. And so I’ve received a lot of a wards, many more than I deserve. But what I’m fond of doing, at any acceptance, is showing pictures and names of many of those heroic engineers lest they be forgotten. The real success that GPS has enjoyed is a tribute to their dedication. They would not let us fail. It was like combat. It was like bloody combat ensuring that all the features were working. So, the answer is that choosing outstanding people is the key to solving hard problems.